For La Coalición de Derechos Humanos, this is our 15th year commemorating El Día de los Muertos. 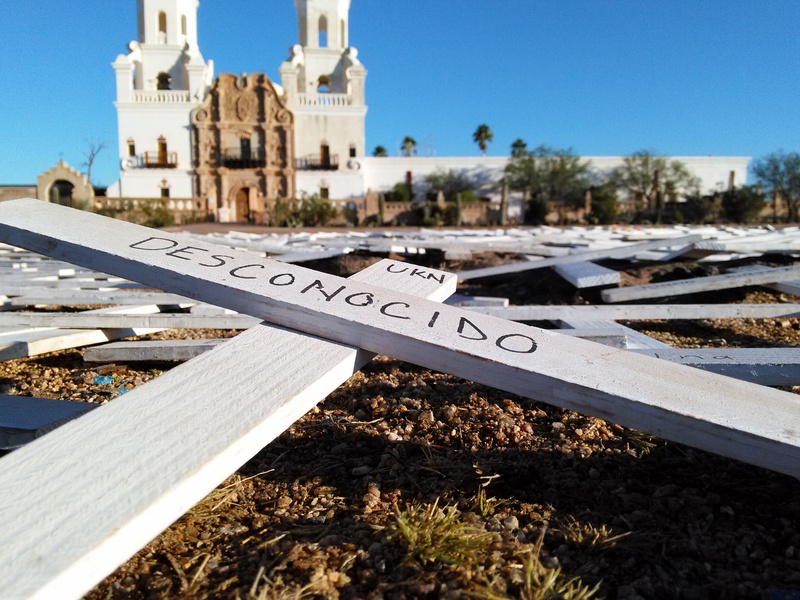 For a decade and a half, Derechos has been making one cross for each set of remains recovered in the Southern Arizona desert. Most of these crosses carry the word “Unknown” on them, representing how effectively the system disappears people. Contrary to what many believe, the system is not broken; it is actually working exactly as intended, putting people in ‘mortal danger’ as stated in the Border Patrol Strategic Plan of 1994. As a community, we come together once a year on El Día de los Muertos and honor each of the lives taken as a direct result of U.S. policies. As we walked 8 miles from St. Johns Church to the San Xavier Mission again this year, we did so as migrant deaths have recently been highlighted in the media with tragic photos of dead children on Greek shores, and we find ourselves reflecting upon and mourning these local deaths in a global context. We have been reflecting that living in a country like the United States means demanding that our government accept responsibility for many of the migrant deaths around the globe whether it be because U.S. policies and practices contribute to climate change migration, the U.S. continues to engage in military invasions that spark refugee crises, our government funds the militarization of Mexico using the pretext of a drug war, or they are the impetus behind neoliberal economic policies such as NAFTA. While it is important that migrant deaths are garnering the attention they have always deserved, when such a thing as death becomes more visible in the media, people inevitably begin to talk in numbers. We hear things like: So far this year, there have been 2700 deaths in the Mediterranean and at least 137 deaths in the Arizona desert. We thus found ourselves doing the same as we made another 137 crosses to add to the already 2,771 that we began in the year 2000. Yet we must recognize that these numbers don’t tell the whole story for several reasons. Last year, as we prepared for Día de los Muertos, we did so at the same time the Border Patrol was touting themselves as humanitarians, using skewed numbers to claim that their “life-saving” efforts had actually reduced the number of people who died in fiscal year 2013-2014. The stories that we hear at Derechos Humanos’s Missing Migrant Hotline, however, are an ever-constant reminder of what is really going on: mothers, fathers, brothers, and sisters continually go missing and are disappeared into ever more remote terrain, as planned. The truth is that any discussion of numbers and ‘humanitarian efforts’ is taking place in a context where the Border Patrol’s mere presence in the desert, in addition to their checkpoints, are directly linked to the death of each person whose remains are recovered. And we also know that there are hundreds of remains that are never found and don’t get added to the Pima County Medical Examiner’s Office’s yearly count. This alone is a strong reminder that whether or not people are being disappeared in the Sonoran desert or the Mediterranean, the vastness of these geographical spaces ensures that the real number of deaths will likely never be known. The calls that we receive at Derechos when loved ones go missing are proof that the enforcement practices that the U.S. Border Patrol uses in the field, no matter what their press releases claim, are anything but humanitarian. We consistently hear stories about how the Border Patrol scatters a group, apprehends the majority of the group members, and then leaves others to fend for themselves, often without their guide and inevitably without enough food and water to continue their journey. In this case, what matters more to the Border Patrol? Are two people left to die worth the apprehension of eight? One recent call that came into our Missing Migrant Hotline is a perfect example of the Border Patrol’s (and other law enforcement agencies’) disregard for migrant lives and also a good reminder of why individual stories are more powerful than numbers. When one of our volunteers received a call about a group of migrants lost and in bad medical condition in the desert, she and the family of one of the lost migrants immediately began to call the authorities, asking them to employ their available resources. Instead of receiving the help they sought out, however, they were faced with immediate and deadly indifference. All authorities refused our requests for a search, and we were told by one Border Patrol agent that “We aren’t going to take a helicopter out for just a few subjects.” A few subjects? Or a few human beings? How many people need to be missing to make the Border Patrol care? Do the numbers actually matter here? In the case of a 20 year-old woman with U.S. citizenship that went missing in the Catalinas near Tucson, 1 seemed to be the magic number. As we were glad that she received a life-saving response, we must ask ourselves if the difference in response in these distinct situations was more about race and/or citizenship privilege. Outrageously, we hear far too many of these stories where certain people’s lives are valued over others. In contrast to missing hikers, some migrants, whose lives are at stake when their 911 call automatically transfers them to the U.S. Border Patrol, are forced to depend upon the same agency that enforces deterrence policies that push them into remote terrain, and maybe even initially cause them to be lost. As we demand accountability from our government for migrant deaths, we also must point out that U.S. funding via the Mérida Initiative, and more specifically The Southern Border Plan, is disappearing an unknown, but likely large, number of people before they even get to the physical U.S.-Mexico border. It has recently been argued that the U.S.-Mexico border has for several years now been extended all the way to the Mexico-Guatemala border. July of 2015 marked the one-year anniversary of the U.S. funded Southern Border Plan, which mirrors the deadly Border Patrol Strategic Plan of 1994 by adding checkpoints along the southern border, adding and training more government officials, adding surveillance equipment, and spending tens of millions of dollars. Effectively, the U.S. government has outsourced and funded a plan that knowingly kills people, forcing Central American migrants into dangerous routes as another form of prevention through deterrence. The deterrent in this context is, conveniently, organized crime, gang violence, and raids by abusive government officials. Let us be reminded that we are living in a crisis, and we don’t need numbers to tell us so. As we walked the 15th annual Día de los Muertos pilgrimage, we reflected on how it felt that we can never do enough to combat this crisis. A crisis, by the way, that our own Isabel García together with Raquel Rubio-Goldsmith have documented and forewarned against throughout the decades of NAFTA’s development. The number of calls that we receive at our 24-hour hotline, even if they have tripled over the last year, remind us that we are confronting a force that is so much bigger than us, a force that has been gaining momentum since the beginnings of colonization over 500 years ago. Knowing that the force of colonization that has led to white supremacy and a variety of systems of oppression all throughout the Americas have lasted for so long, may make it seem futile to keep fighting. But we don’t think so. We see hope with each family that takes action, that stands up against fear even when policies of deterrence are in place, not giving up the fight for the dignified life they deserve. If they have hope, we have hope, and we will continue to answer calls. So we hope you can join us on this journey by supporting our work, joining us next year on our walk, and raising awareness about migrant deaths and the inhumane border policies that cause them.